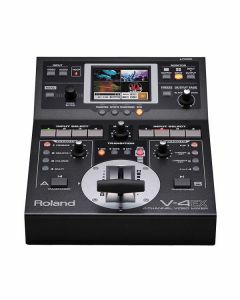 The Roland V-4EX is a cutting-edge video mixer that develops and surpasses the user-friendliness and quality of the V-4. The V-4EX features a touch-screen colour display and four interference-proof HDMI inputs. An innovative mix engine consistently guarantees crystal-clear images, as well as during transition effects. The V-4EX is perfect for studio production or seamlessly edited live video and audio. The V-4EX separates itself from the rest of the pack by the simplicity of its operation. There are actually only a small number of controls for such a wide range of applications – an interface with which it is simple become familiar. The large colour touch screen allows for quick control through navigational menus, so transitions and effects are rapidly and effortlessly added. This makes the V-4EX well suited to live mixing, providing professional, refined and faultless transitions and effects. The large T-bar controller acts as a stable video fader carving out seamless, stutter-free transitions between images. It is also possible to employ a fade-to-white or fade-to-black effect, by means of the Output Fade knob. Regardless of video input type, the V-4EX delivers more than 250 different transition effects. From simple fades to artistic, creative transitions: with a few pushes of a button they are all within range. This tiny video mixer provides spectacular visual results.